About Us | North Air, Inc.
We have been serving the Greater San Fernando Valley along with the San Gabriel Valley, since founded in 1990. We are, and always have been family owned and operated. We're proud to offer satisfaction to our customers, in fact, nearly all of our business is done through referrals by customers who are satisfied with our work. 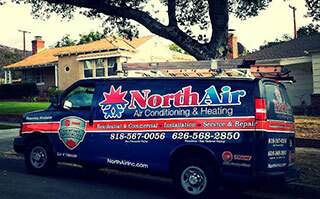 North Air, Inc. installs, repairs and services residential and commercial HVAC systems. This includes air conditioning and heating units. We have a BBB (Better Business Bureau) A+ rating.